(ATLANTA) - The 2017 NLL World Champion Georgia Swarm made a blockbuster trade at the beginning of the 2018 NLL Entry Draft on Tuesday night. Georgia traded forward Jesse King and its No. 23 overall selection to the Calgary Roughnecks for its No. 7 overall pick and forward Holden Cattoni. Now with two picks in the first round, the Swarm selected Brendan Bomberry from Syracuse University No. 7 overall and Adam Wiedemann out of Belmont Abbey College at No. 8 overall. Cattoni, a two-year veteran of the NLL, is a product of Johns Hopkins University. In 2017-18, the DeWinto, Alberta native recorded 76 points (36G, 40A) over 18 games for the Roughnecks, helping Calgary return to the West Division Finals. The lefty forward is listed at 5-foot-11 and 216 pounds. "We wanted to replace some people on the defensive side of the ball and had this opportunity," Swarm Owner and General Manager John Arlotta said. "It's a difficult decision, because we love Jesse. He's been with us and an integral part of the team. But we felt like we had to make the move to restock the defense and also were able to get a really good lefty that scored 36 goals at the same time. Difficult decision, but it's one we had to make given the roster, where it stands." Arlotta and his team drafted players they believed fit the Georgia Swarm mold while addressing the Swarm's needs, picking up fast and athletic guys with great stick skills and high character on and off the field. The Swarm immediately used its newly acquired No. 7 overall pick to select Bomberry. 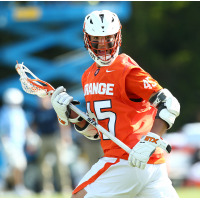 A midfielder for Syracuse, Bomberry led the Orange in his senior season in goals and as its team captain, finishing with 36 points (28G, 8A), 17 ground balls, and four caused turnovers. The Osweken, Ontario native played for Team Iroquois in the 2018 FIL World Championship in Israel, earning the bronze medal with the Thompson brothers and Randy Staats, familiar faces to Bomberry throughout his lacrosse career. "I have a lot of familiarity with those guys, played with them a lot throughout the years," Bomberry said. "To be playing with them again is going to be awesome. Just to have that familiarity will help me with my comfort level, and I hope that pays off in the end." "Bomberry played out the back door with Six Nations this summer and did a great job," Arlotta said. "He's another guy that can run up the floor and score." The other Swarm first round pick, Wiedemann spent his collegiate career as an attackman for Belmont Abbey. In his senior year, the Caledon East, Ontario native posted 67 points (38G, 29A), 41 ground balls, and six caused turnovers over 18 games. "Wiedemann was the Major Series Lacrosse Rookie of the Year," Arlotta said. "He's a guy who can be a stay-at-home defender but can run up the floor and has great stick skills." "I think fans should expect some explosiveness up the floor in transition," Wiedemann said about his style of play, "hopefully get a few goals, but mostly start the offense with a quick-hitter right away on a two-on-one or three-on-two with a couple of the O guys or get a couple of getaways, see what happens. But I like to play some tenacious D, kind of get into some guys a bit, then get up the floor as fast as I can and help out on the O end." In the second round, the Swarm selected Joel Tinney (No. 18 overall), Steven Orleman (No. 19 overall), and LeRoy Halftown (No. 21 overall) before trading its No. 21 overall pick to the Vancouver Warriors for a second-round selection in the 2019 Entry Draft. Tinney, a graduate of Johns Hopkins University, played midfield collegiately. In his senior season, he played in 17 games and finished with 53 points (21G, 32A), 36 ground balls and seven caused turnovers. "My biggest asset is my speed, getting up and down the floor quickly, whether that's D to O or offense to defense," Tinney said. "I think speed is one thing I bring and a little bit of an edge, kind of playing chippy and making sure guys aren't comfortable in any situation." Orleman plays goaltender like his brother Kevin Orleman, who served as Georgia's back-up goaltender in the 2017-18 season. Playing for the Brampton Excelsiors in 2018, Orleman spent 240:01 min. in front of the net during the regular season, finishing with a 3-1 record and a 6.25 GAA. He played 839:33 min. as Brampton proceeded through the playoffs and compiled an 11-3 record to go with his 6.50 GAA. "I think my angles are pretty sharp," Orleman said. "I'm not one of the bigger goalies out there, so I have to rely more on my speed and my reaction, and I think I do that pretty well. That's one of my better points of my game." Halftown played for New York Institute of Technology, netting 52 goals for the Bears in his senior season, fifth most in program history. He finished his final year of college with 70 points (52G, 18A), 25 ground balls, and four caused turnovers through 18 games. The Swarm would trade its No. 34 overall pick before entering the fourth round. Georgia made back-to-back selections in it, taking Justin Lemcke of the Whitby Warriors No. 46 overall and John Sexton of Notre Dame University No. 47 overall. With three picks left in the final two rounds, Georgia capped off the night by selecting Tanner Poole from Barrie Lakeshores No. 60 overall, Nolan Apers from Lehigh University No. 61 overall, and Sawyer Howell from Mimico Mountaineers No. 71 overall. Georgia's impact in the draft generated new excitement and energy for the team, and the organization will take that feeling and bring it with them to the Swarm's Training Camp in November, creating another competitive camp leading up to the 2018-19 season. "We're less than six weeks out to the start of camp," Swarm head coach Ed Comeau said. "The draft is usually that point where everyone really starts to say, 'Hey, it's getting real again.' The excitement level is getting high, and I know the players - I was getting a lot of texts from players tonight from our team talking about the excitement level for them. There will be lots of competition, and we have some really good young players." Georgia opens the 2018-19 NLL season on Saturday, Dec. 1 with a Meeting of the Champions against the Saskatchewan Rush at Harrah's Cherokee Casino Field at Infinite Energy Arena. Faceoff is set for 7:05 p.m. ET. Fans can get two (2) Lower Level End Zone tickets to the Swarm's Home Opener and a 2017 NLL World Championship hat for only $60 by visiting GeorgiaSwarm.com/Opener and entering the promo code OPENER. Season Tickets for the Swarm's 2018-19 season are On Sale Now! Season Ticket packages include 10 games (nine regular season games and one postseason game) and a handful of VIP benefits. Join Sting City by reserving your membership today by calling 844-4-GASWARM.